It's Adar, and the fun has begun. What better way to usher in the Purim season than with a flash mob invading Jerusalem? The laughing flash mob gathered outside the old city of Jerusalem on Thursday February 13, 2014 to get on the Jerusalem light rail and spontaneously burst into fits of extreme laughter. 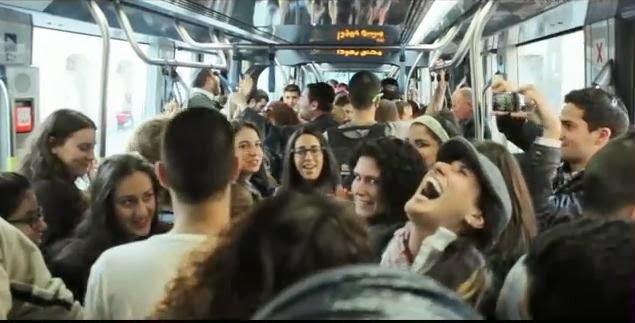 The unsuspecting passengers of the Jerusalem light rail did not know what was going on and the laughing flash mob caused smiles, laughs, and even some involuntary participants. Let's keep the laughter going from this month of happiness and joy to the rest of the year and to the rest of the world.